The Confessions of a Passive aggressive Leader would have been a more apt title for this post ! It has been on my mind since then as is my focus on creating change. “Bossy” is not a nice term and as an artist I really crave a “quite studio at the top of the hill overlooking an ocean”. As a female “Bossy” is not considered an attractive trait. So I kept hoping that others would would take the mantel and lead. We all seemed to recognize the same need and voiced the same solution, I assumed they would execute. My parents spent a lot of time teaching diplomacy and fairness, As the eldest of six siblings being fair and respectful of others is deeply ingrained and as a believer in an open society I am especially mindful of the rights of others! IT MY WAY OR THE HIGHWAY! 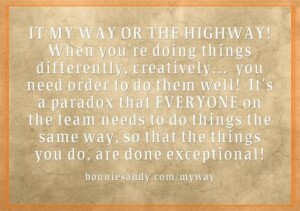 When you’re doing things differently, creatively, you need order to do them well! 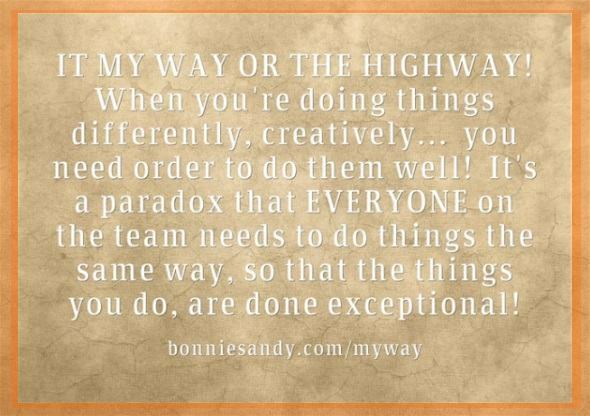 Then the paradox is that EVERYONE on the team needs to do things the same way, so that the things you do are done exceptional and it becomes easier to identify the challenges and make changes!